ALPHA-1 is coming to town and Harrison Silverdale’s BB has them! Alpha-1 is coming to town! Silverdale to be exact – in the Rose Room at Harrison Silverdale to be more exact – 1:00pm to 3:00pm and we are all excited. The speaker is Nancy Bartholomew, with Prolastin-C from Grifols Inc. If we do not test, we cannot know and could easily be misdiagnosed and medically treated for the wrong condition. Look for a table and chairs set up and friendly Harrison folks…Joyce is the RRT Harrison volunteer Better Breathers liaison…we are lucky to have her. If anyone needs a ride, contact me. Meet Mark and daughter, Kim, the Cystic Fibrosis girl who started it all and has helped countless thousands of COPDers from a life of medical ignorance. First…Today I walked upright across the shallow end of the pool. No walking sticks or the normal hunched over posture and limp. I walked upright, my bone on bone left hip locked in muscle tightening of my left bun. Awed and surprised, I walked back and forth three or four times. Saturday, 5 February 2011 I walked upright through the water without walking sticks or a walker or floating. It was the first time in two or three years. Today was my third session with Marilyn, a real swimming coach and I didn’t intend to mention it until much later but I’m still jazzed about walking the end of the pool. Another time on what we’re doing and why – but what I do today goes back to my online support and advocacy group, EFFORTS and Mark Mangus, Sr.
Baby steps as Marilyn says … and reach beyond shortness of breath to improve according to Mark. YES! A problem I developed that I discovered at a family Thanksgiving some six or seven years ago was laughing hard gives me a splitting headache at the base of my head and I have trouble breathing– this from a person who rarely gets a headache. I’ve never known why until I asked Mark recently. Following is my question and his answer. Additionally I asked him what made him stretch out so far beyond and disprove what medical sources ignored about COPDers. We CAN get better! “….You also just opened the door to something that bothers me whenever I laugh hard… the back of my head -occipital bone, I think- feels like its going to split wide open with the pain of a massive headache…something I rarely, ever, get. It is only in that spot and only when I laugh hard. I can’t stop without great effort though pain is a great incentive to stop. I used to laugh a lot, all the time…now I don’t want to. ‘retrograde’ (backwards) through your jugular veins and to your brain,. This post is about an RRT extraordinary, Mark W. Mangus, Sr., BSRC, RRT, RPFT, FAARC individual. It was reading his posts in my online COPD support and advocacy group that helped me understand that we could help ourselves through exercise – going beyond what any doctor would prescribe for a COPDer. His championship of patients going beyond – way beyond what they think they can do and the support of EFFORTS’ites are probably a key reason I’m still going today – start and stop though it’s been over these years of piling on medical conditions – since I was hospitalized at Harrison in 1997. COPDers aren’t helpless – even though we’ve now progressed to the third leading cause of death in the United States and fifth leading cause of death in the world. 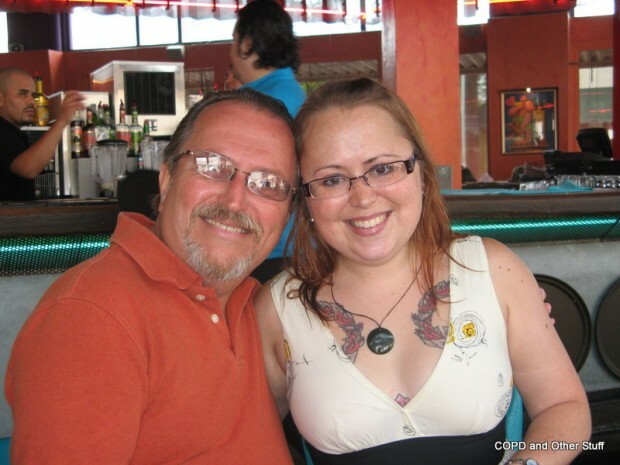 Meet an extraordinary dad, Mark and the girl who started it all, daughter, Kim. “You asked me to speak to how and why I’ve become such an advocate for patient education – there are several reasons and influences. First, when I became an RT, instead of pursuing medical school and an MD, I decided that my life’s quest would be to become the best RT I could and hopefully, with hard work and a bit of luck, along the way, to ultimately be considered one of the top RT’s of my era. Now that’s pretty ambitious and can be construed as a bit cocky. But, as with most all who enter the health care profession, I believe we all have a desire and even a calling to ‘help our fellow man’ and to try to be the best we can be. At least, we start out that way, for the most part In our particular positions, we choose to do that through delivery of health care and to foster better health. Dr. Thomas L Petty is one of my great heroes and a source of greatest inspiration. As a pioneer in so many aspects of pulmonary medicine, he was not afraid to take on daunting projects and challenges, many of which resulted in our ground-level information on some of the most important lessons we’ve learned about pulmonary physiology and disease to date. I also decided that to become the best RT I could envision, I had to go beyond the simple boundaries of standard RT education. So I have studied extensively to include medical knowledge beyond the boundaries of RT. As a corpsman in the USAF, I was exposed to many non-respiratory aspects of disease and its treatment. Being assigned to Wilford Hall Medical Center, the Air force’s premier institution in the world, at the time, I also was given opportunities for training and experience that I would not have been afforded anywhere else. So, I have to say I’ve been fortunate to have been in the right place at the right time many times in my career, with regard to training opportunities and those who have taught and mentored me along the way. I have had the opportunity to learn much that other RT’s never get a chance to experience. Having participated in what was the pilot program for physician’s assistants while I was in the Air Force, I was given training and opportunities that are simply not a part of RT training. That has given me an edge that others have not had opportunity for. I was one of a group who were present and part of studies in what was at the time, cutting edge respiratory research and received unique training and experience during that period, again, not available to RT’s then or in the same scope for years after those early days. That training and experience instilled in me the realization that I had been given a special gift; one which I was compelled to build upon and utilize to the best benefit of people I could. With the birth of my daughter and the discovery of her affliction with Cystic Fibrosis, I both realized the extent of the blessing of knowledge I had gained, in being the one who, while others were pooh-poohing my suspicions, indeed diagnosed her as having the disease. That came through having had the good fortune to work with the disease for two years before she was born and to work to learn more and understand the disease sufficient to recognize and suspect it before any obvious signs had manifested. This was actually a bittersweet realization of the knowledge I possessed at the time, as it included both the angst and horror of learning of her problem and the gratitude for knowing enough to discern it before she suffered any serious effects of the disease. Treatment was started quickly and my wife and I set out on what has become a 29-year journey to give her the best care and advantage in life possible. That has, as you know, included two double lung transplants in addition to the many events over the years preceding her first transplant. When I was asked to take on the task of formulating the first comprehensive pulmonary rehabilitation program, I felt like a fish out of water. To that point, my understanding of COPD was very mainstream; ‘you simply can’t do anything with folks whose lung function has gone south as it does when COPD advances’. Yet, I chose to look at it with an open mind in an effort to try to learn “why” their plight was so ‘dead-end’ and hopeless and to ‘maybe’ find a way to make the inevitable easier for them and even help them to find a better way to live within those conditions they could not change. Today, I am ecstatic to acknowledge how wrong I was back then, along with the majority of others in medicine, having been taught some of the greatest lessons of my career during these past 25 years of study and work in pulmonary rehabilitation and ‘disease management of lung diseases’. The more I dug into COPD, the more I learned that most everything about the disease was “theoretical” knowledge that had not been supported by evidence-based study. As I learned more about what was empirically known, I increasingly saw the incongruities and contradictions in the real world to what was presumed gospel knowledge about lung disease. Then along came lung transplantation and then LVRS and the advances in medications and research into cause and effect. The undeniable truths and tragic fallacies about COPD and other lung diseases became glaringly apparent. \Unfortunately, too many of those in health care, continued – and still continue – to hold to false ideas about what can and should be done about lung disease and how to improve life with these diseases. So, I joined Dr. Tom and the many others who ‘crusade’ for a better lot in life with COPD. And, because there is still such disparity and nilistic attitude toward COPD, in particular, added to the fact that as with several other kinds of chronic ailments, patient knowledge and ‘active’ participation in their own care have demonstrated improved living, longevity and reduced infirmity with chronic disease, I long ago decided that I had to play a leading role in my capacity to educate patients and bring them “into the loop” of their own care, even to the chagrin of many health care professionals – yes; including “doctors”! So, for the last 20 years, I have become increasingly involved in the educational front on a widening scale to the international stage. I join a host of others in our effort to do our part, simply because it’s the ‘right thing to do’. It’s not for fame or financial gain, though that is always nice, if it comes with helping folks. Lord knows, I’ve not become a rich or even modestly wealthy man in my endeavors. That’s OK with me. I have what I need and can look back with satisfaction knowing what I have contributed. And I can look ahead to what still needs to be done. That’s my focus and my ongoing quest. Would I like to see ALL RT’s hold the same outlook and attitude? SURE! But, I, too, have read Plato in my studies of many years ago. And I understand that there is no “Utopia” in the ‘real world’. Nevertheless, as I endeavored to explain and encourage in the chapter I contributed to Dr Tom’s last book: “Adventures of an Oxyphile2”; a chapter written for RT’s and about RT’s, I hope I can help at least some of my colleagues become better than they might otherwise have been, had they not encountered me in some way. Photo taken at Kim’s graduation party when she finished her BSRC degree August 2010. Thank you Mark and Kim!